So I'm not one to shamelessly self promote.. well, alright, maybe I am. A couple of weeks ago a local journalist (Jillian McHugh) was doing a piece on Supanova in Perth and the type of people who go along to the event. A friend put me in touch with her and this great (and slightly embarrassing) interview with me was posted. Honestly I expected a line or two, not a full article. Still, it was pretty fantastic to get some attention. Move along to this last week where I posted about the recent Avengers issue set in Perth. This caught Jill's eye too and she brought me back for another article. After waiting on some legal dealings with Marvel it was finally posted this morning. Hooray, look at me go! Then I got two phone calls from local radio stations wanting me for a couple of on air interviews. After almost fainting I agreed. 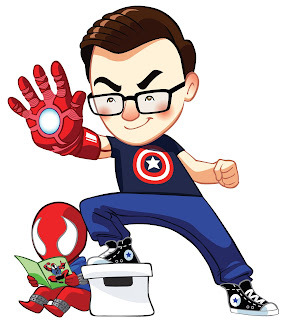 I had a quick chat with 720 ABC about the Avengers in Perth issue and a good five minutes with 6PR about myself, the hobby and Supanova among other things. Both are audio files hosted on my Dropbox, so don't worry about any nasties. The Weasley Twins at Supanova Perth 2013! Supanova Perth 2013: Fruitless Purs-loots!